Women are sometimes afraid to cut their hair short because they fear they will lose versatility and look masculine. The answer is here: short hair with bangs. Firstly, short hair can be styled in plenty of ways and is easier to manage – especially if you are busy. Secondly, bangs are just what you need to jazz up every short hairstyle from the classic pixie to choppy bobs. Bangs are fantastic for adding volume and texture; especially if the hair is thin. They also work to give height to a style and look good on straight or curly hair. Women of every age can wear shorter styles, because there are all sorts of cuts; ranging from the classic looks to the extravagant coifs. These short styles are uber feminine and chic, guaranteed to turn heads! Here we see sleek locks in caramel tones that have been cut into a shoulder length bob. Bangs have been cut to provide the do with a lift and a messy off-center parting has been added. The top hair alongside the parting has been blown out to have a high wave. 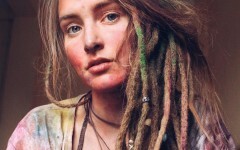 30 Stunning Dreadlock Styles for Girls — Rock Your Dreads! 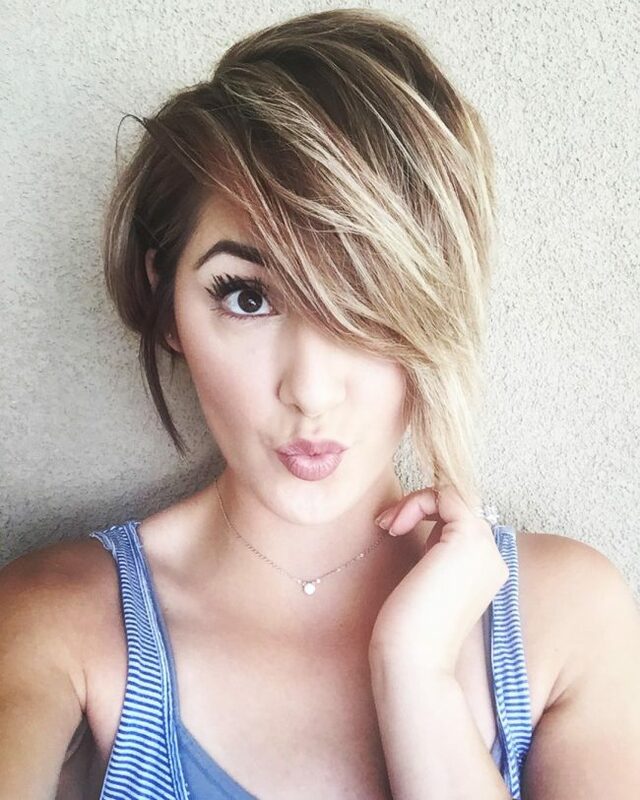 In this picture, we see a short bob cut that has a blended step detail at the back and layers with light highlights on the top. Her chestnut hued tresses have been given a jagged parting, with the hair on the right brushed forward and to the side to frame her heart-shaped face. 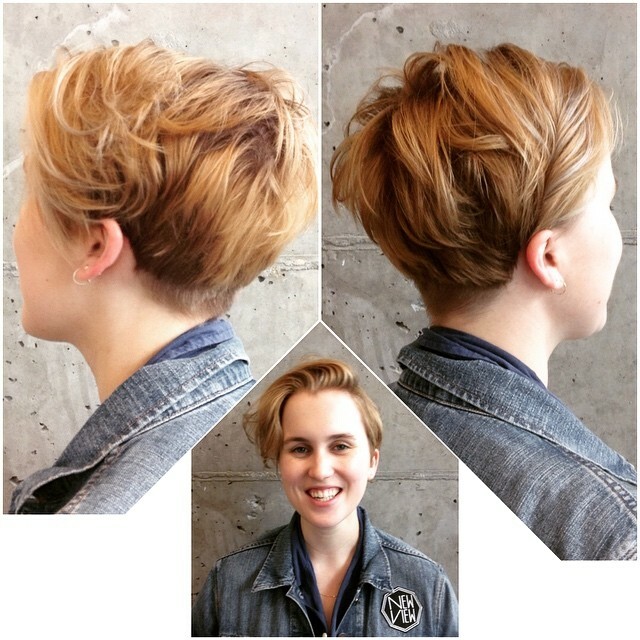 This pixie cut has been updated to uber trendy with the addition of some modern touches. Firstly texture has been added by layering the slightly longer top hair and secondly, scissor snips have given the style eye-catching edges. The base color is cola black with a cherry ombre. Her lovely soft brown locks have been cut and blown into a neat bob hairstyle with a few fly away strands. 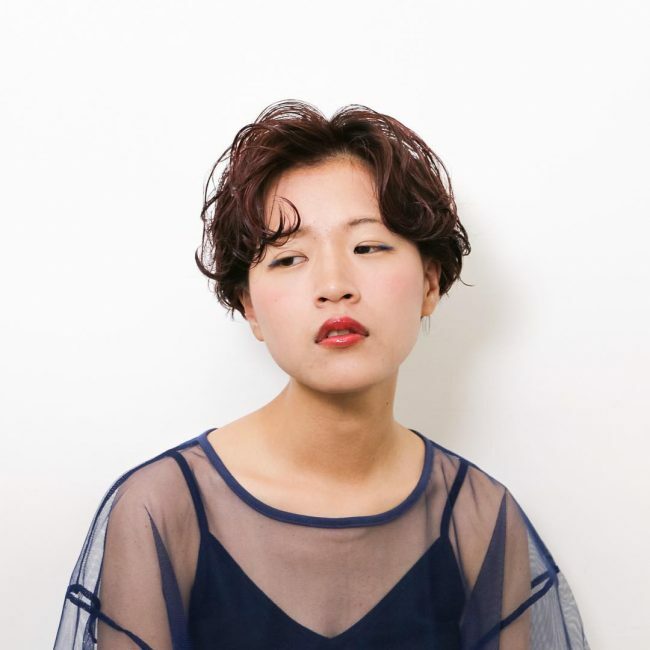 The style has a center parting, but there is also a layered fringe that has been brushed forward and to the side to gently graze her forehead. This is a natural and relaxed look that is still radiant. 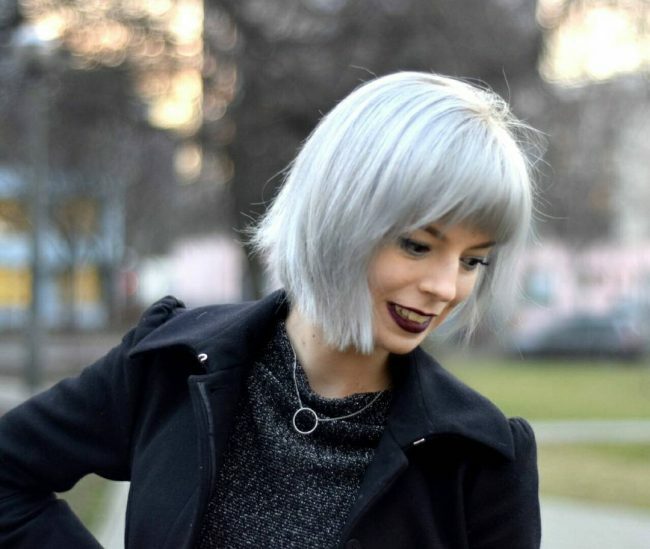 This girl has had her hair cut into a cropped bob and given a subtle brown ombre. Layers have been blended in and then a curly loose wave texture was added by twisting small strands with a straight iron. There is a messy parting and the front hair has been swept up and back over her forehead. 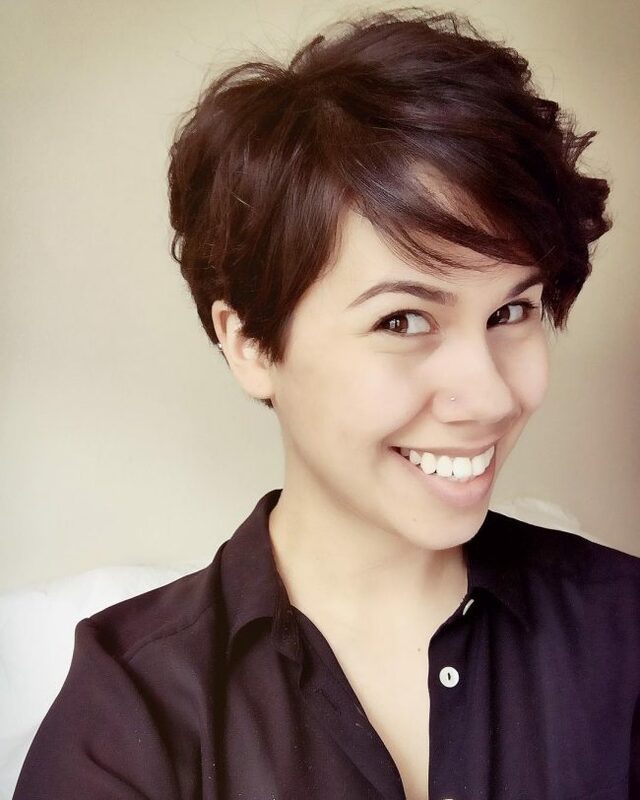 In this picture, her hair is cut into a layered pixie cut with a step at the back. The hair has been blown out and texture has been added to the dark chocolate locks by ironing small sections. Doesn’t this hairstyle style seem wonderfully French? It’s a shaggy style bob that falls onto her cheekbones and has a destructured side parting. Loads of soft curls add texture and a brow-length fringe has been added. All together this espresso colored mane is full of fun and bounce! 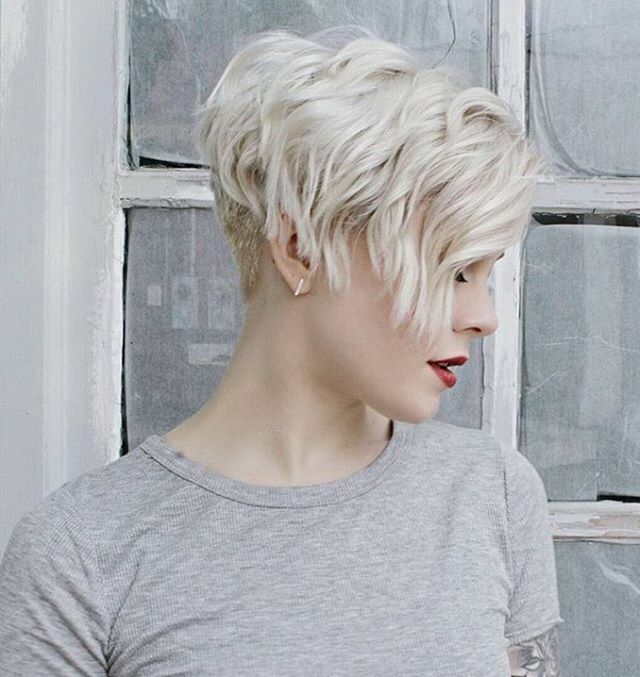 In this version of the pixie cut, the top hair has been kept longer than the hair at the back. It’s been blown out to be wavy with some small curls and while there is no defined fringe there is hair that falls onto the brow. The color is quite unique as well – a deep brown-gray with a pop of cerise red at the back. 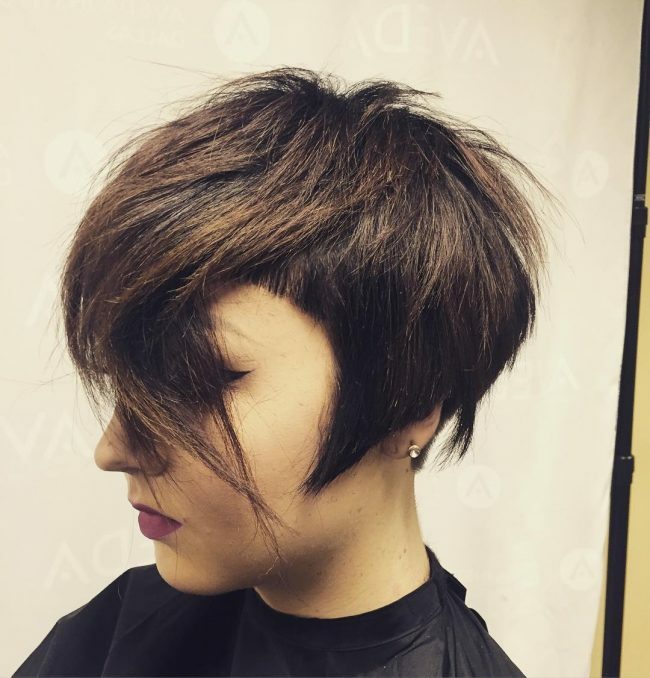 This lovely chocolate caramel hued hair has been cut into a classic pixie with extra texture on top. To the right of the messy parting, the hair has been combed neatly down while the other side has been blown out and brushed forward to curl over the brow. 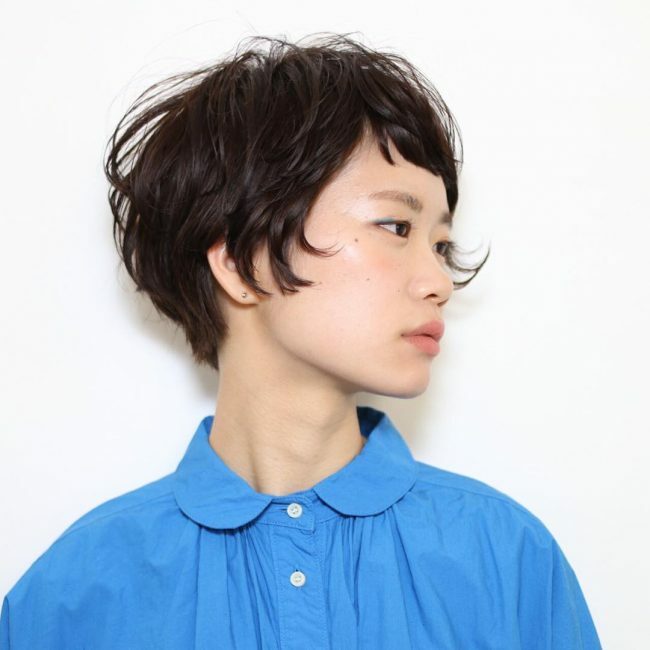 Here a precisely straight cut bob rests against the cheekbones and curves slightly forward. A well-defined short fringe has been added, also with sharp edges. The hair is an eye-catching aubergine hue and has incredible shine. The look is slick and sharp, with not a hair out of place. This style has been created by first giving the hair a full leather black color. Then it has been cut to chin length with the front sections snipped into bangs. A super short, straight fringe has been added and all the hair has been straightened and smoothed down. 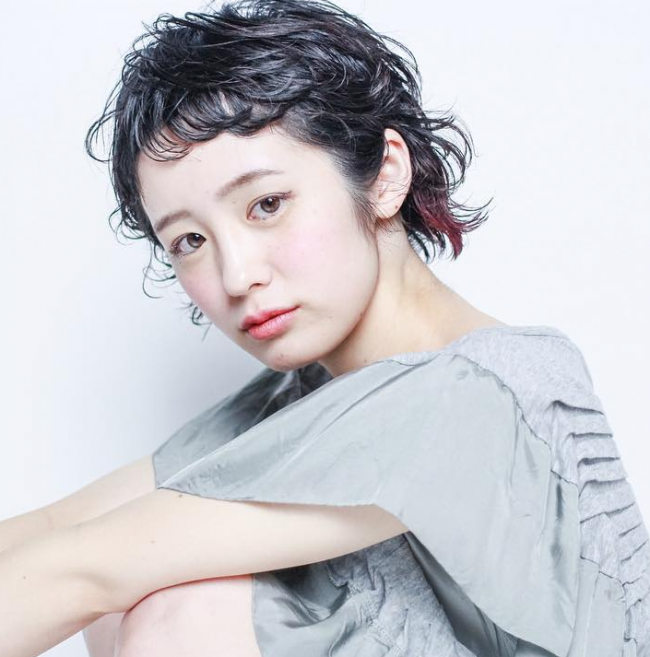 Her hair has been cut into a chin length all around, with discreet bangs to give it body. 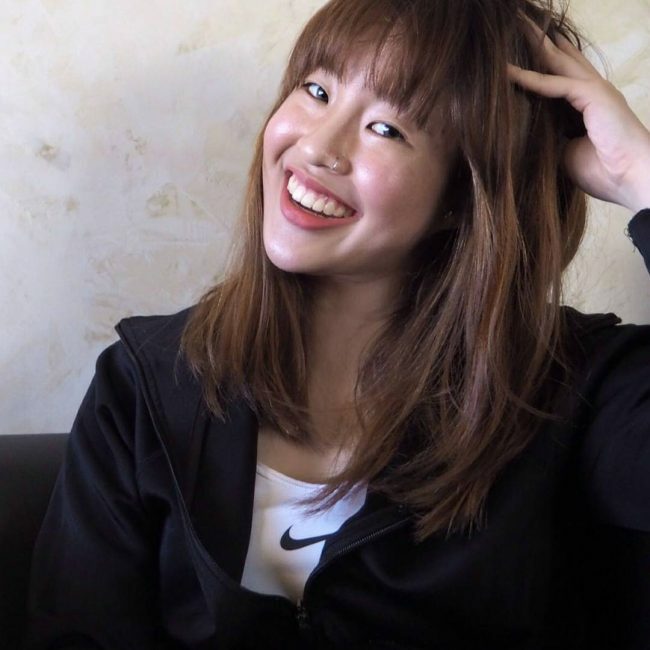 A short, wide fringe that has been ironed straight opens up her face. The rest of the pure diamond colored mane has been blown out and curled inward, and we just see a hint of dark roots. In this picture, the front hair is slightly longer than the hair at the back. A small step detail has been added at the nape of the neck, giving the back a squared off look. The soft champagne-hued hair has been styled in loose waves and the right front section has been twisted and tucked behind the ear. 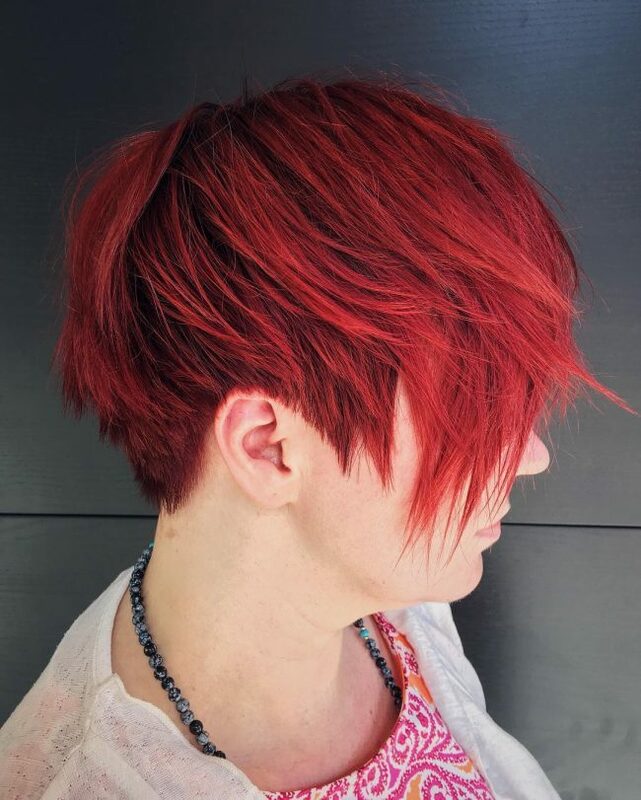 Lovely red shades have been glazed over this rock and roll style haircut. The front hair is cut into cascading bangs with tight tips and a sharp edge at the back. The hair has been blown out and finger combed out from the crown. This look has been created by first close shaving a thin line above the ear. Then the hair has been given a rounded undercut. Above this, it’s been cut into blunt bangs and blow dried straight. A strong wax was probably used to create the swooping top sections. 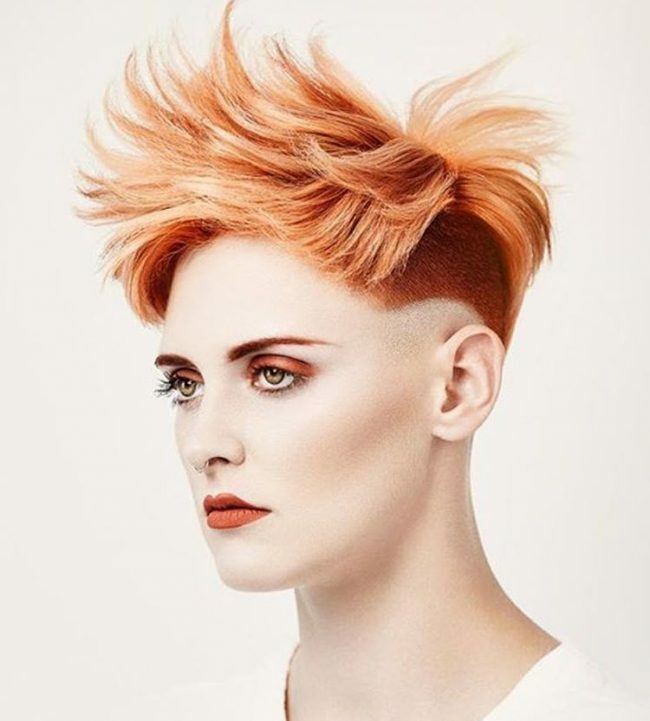 The color is fiery; tangerine highlights over a ginger spice base. In this asymmetrical hairstyle, her ink black locks have been cut to chin length on the left-hand side and left to fall past the shoulders on the right. A scissor cut technique has been used to give the hair a spiky edge and the fringe has been brushed over to the right. The back section has been styled to stand straight up creating an extravagant look. The hair at the back is layered into choppy bangs that become longer and sweep forward. The front section has also been cut in layers, with a fringe that reaches just under the brows. 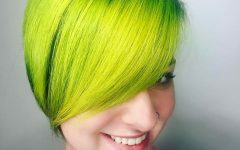 Some small sections of hair have been cut with sharp, straight edges to add interest along with yellow and emerald highlights. In this picture we see a retro 70’s inspired long bob cut. The hair has been teased to give it a wavy texture that is thick and bouncy. A barely there destructured parting is just visible, but the hair has been allowed to fall naturally, making this a perfect daytime look. 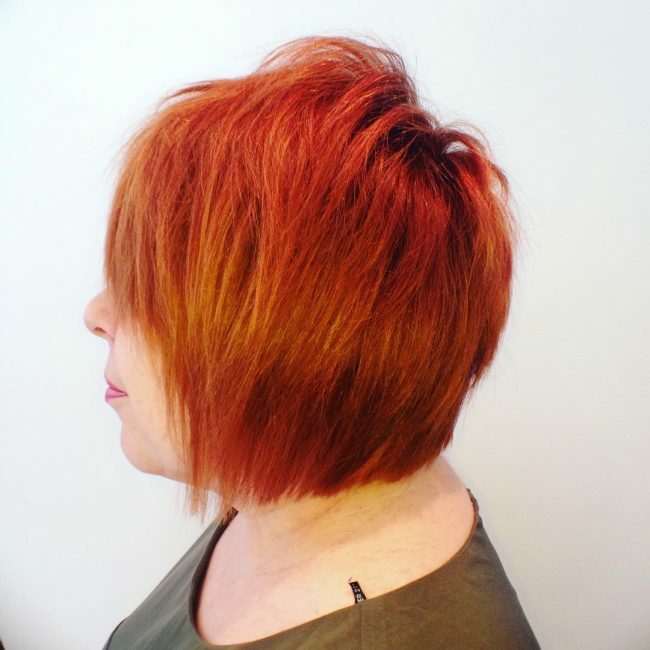 Here the hazel brown hued hair is cut into a charming collarbone length bob that has been layered and ironed to curl inwards, which helps add volume to the hair. Her locks fall from her crown and into a layered fringe that hugs just below the eyebrows. 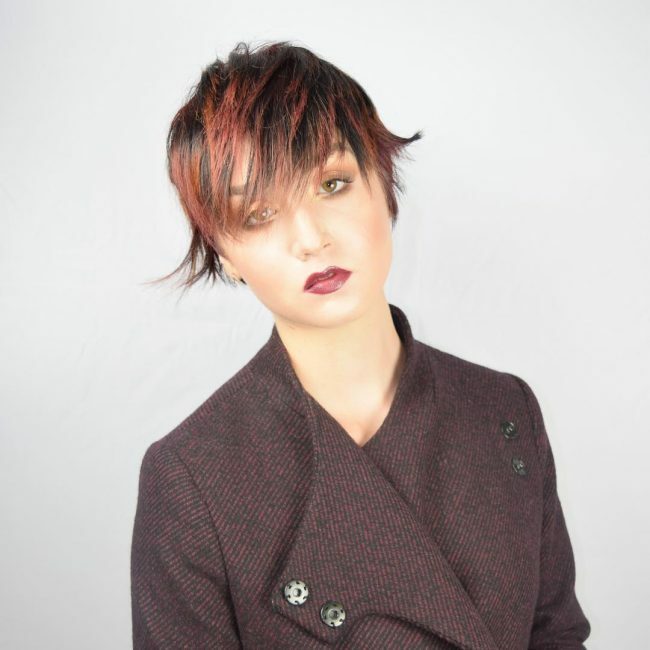 Here a pixie cut has been given an edgy look and not just by the thick pomegranate streaks of color! 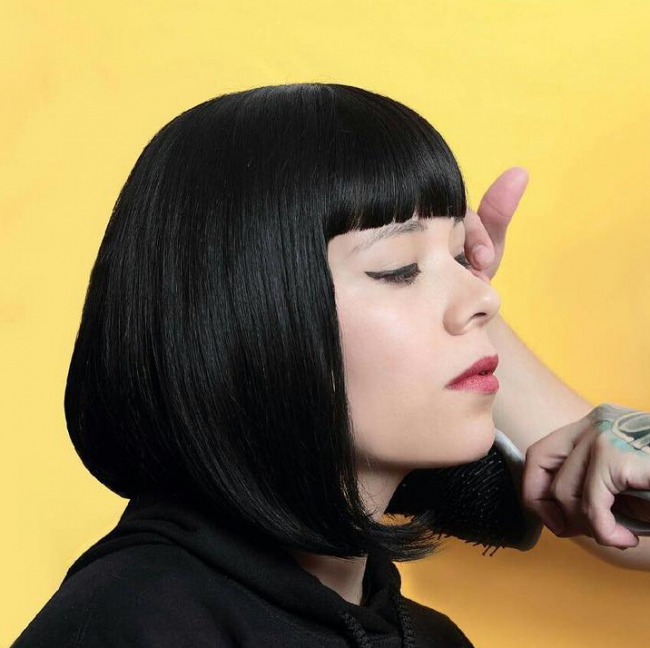 The cut has long blunt edges that taper inward to hug her face and a straight fringe that reaches just above the brows. As a final trendy touch, the hair at the back has been teased up to stand out. Short styles can look so put together – just like this sable-hued pixie. The back is short and the hair has been blended into long waves of bangs on the top. The hair around the ears has been cut to leave them open. This look starts with soft chamomile colored hair that has been ironed straight and parted from the crown. The locks have then been combed forward and graded into a short undercut. The addition of a choppy fringe makes this a perfect pixie. A graceful sweeping fringe helps to give this messy look a polished touch. These luxurious locks have been cut into a chin length bob and the edges have been teased to have a tousled texture. The color is a dark brown with well-placed golden honey highlights. In this style, the hair at the back and on the sides has been cut into two distinct lengths on each side of the head. The hair texture is curly and it falls in loose whimsical ringlets. The front hair has been combed forward and cut into a tight, straight fringe. This fringe, combined with the romantic texture is an interesting duo. Here, her dark violet hair has been ironed straight and snipped into a blunt layered bob that just touches the collarbone. 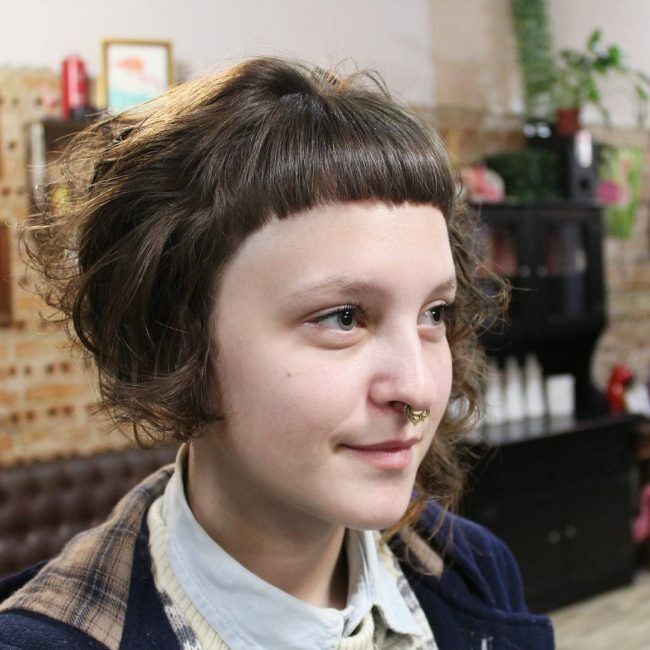 A wide rounded fringe has been added and given a slight curl. Isn’t this sleek style is oh so feminine? Wow, isn’t this color just outstanding? 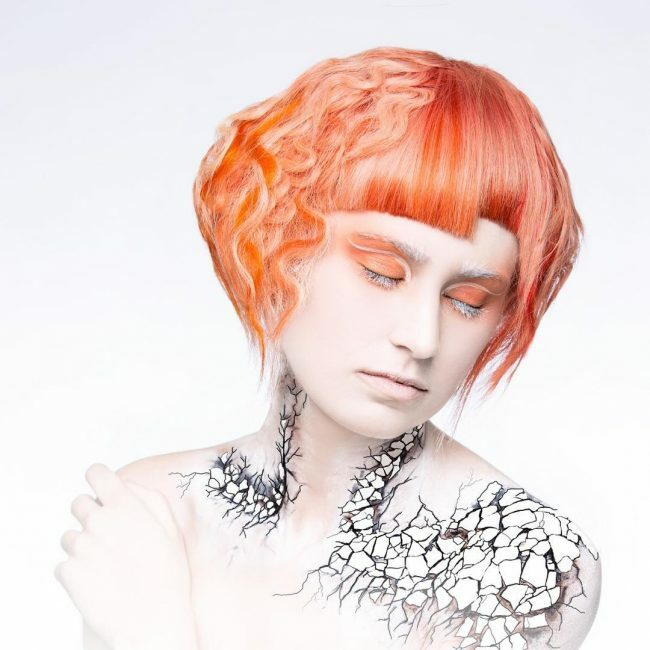 Dark lowlights teamed with butter blonde create a real show for our eyes. 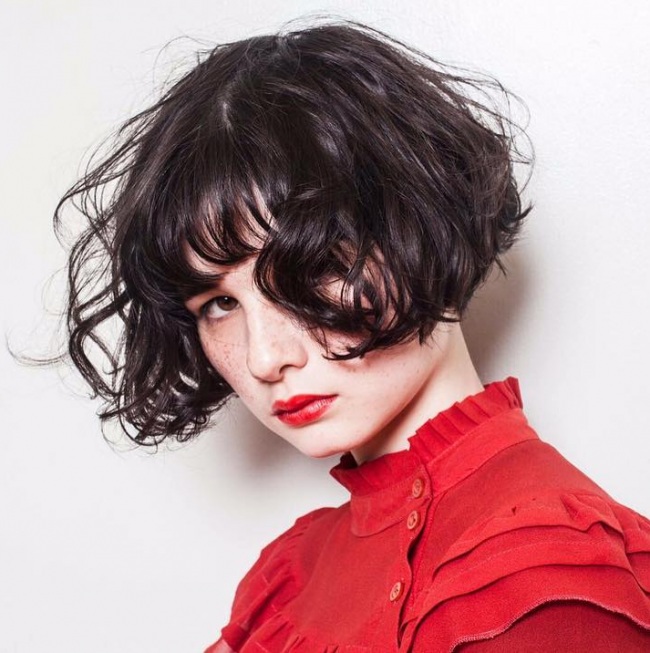 The cut is perfect too – a face framing collarbone length bob with bangs that has been blow dried. The fringe has been combed down and across and hugs the brow. This look has been created over the base of a mid-length bob cut. Rough scissor cuts have been used to create multiple layers of bangs that vary in length and have sharp edging detail. A fringe that just touches the brows has been added and all the hair is straightened. The color is a steel gray with cobalt flashes. 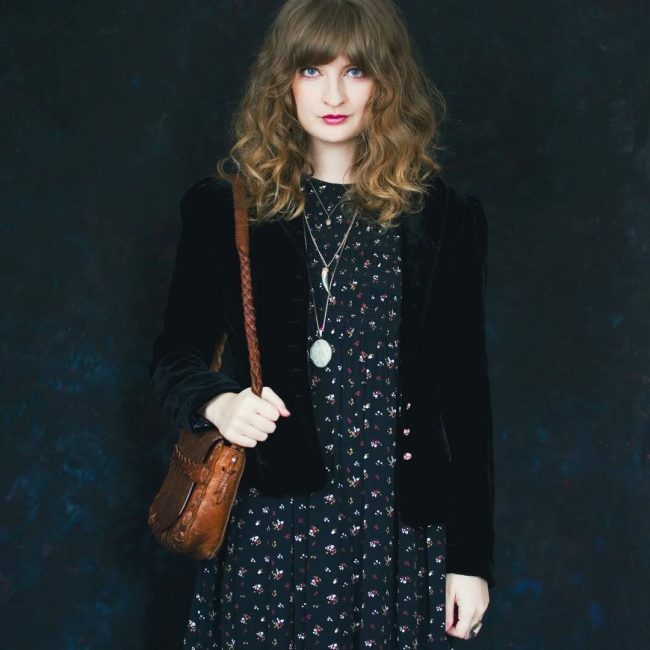 It’s difficult to blend a punk and a polished look but this style has achieved it! We see that from a concealed off-center parting the hair has been snipped on the ear, and then ironed flat. At the back we can see slightly longer locks that curl inward. The top portion of hair has been cut into blunt bangs and then teased up to create height. A singular style! 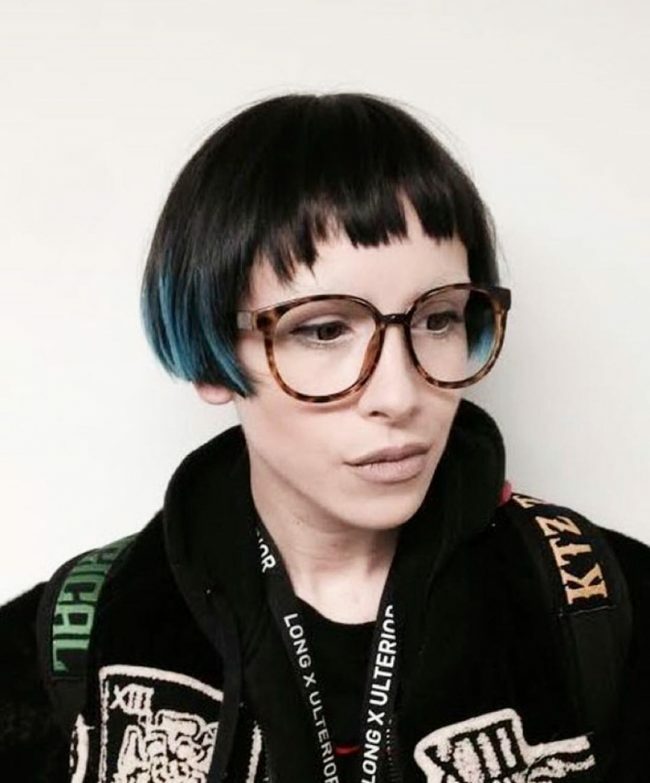 Her hair has been cut into a lovely feathery pixie, with bangs and scissor cuts to create volume. The hair has been straightened and then brushed forward to fall on and across the brow, falling just below the eyebrows. The color is attractive as well, ruby fusion streaks over a licorice base. 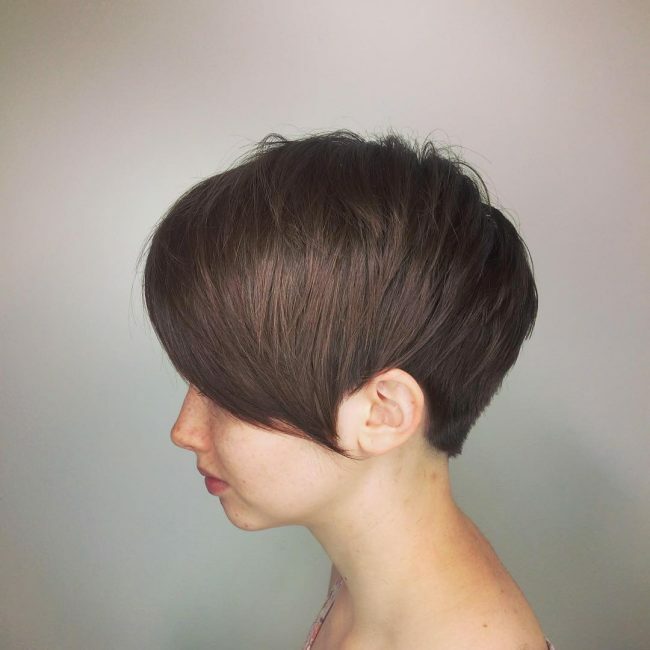 In this short style the sides have cut in a blunt bob style while the rest of the hair has been cut into pixie style bangs at various lengths. Eye-catching detail has been created with the long swooping fringe and sharp cut out detail on the left temple. This look begins with a curved razor cut just above the ears. The rest of the hair is brushed out from the crown and snipped into neat bangs. The longest section of hair sits on the brow, just softly falling below the eyebrow. The hair is ironed with bright peacock blue and pansy purple highlights. 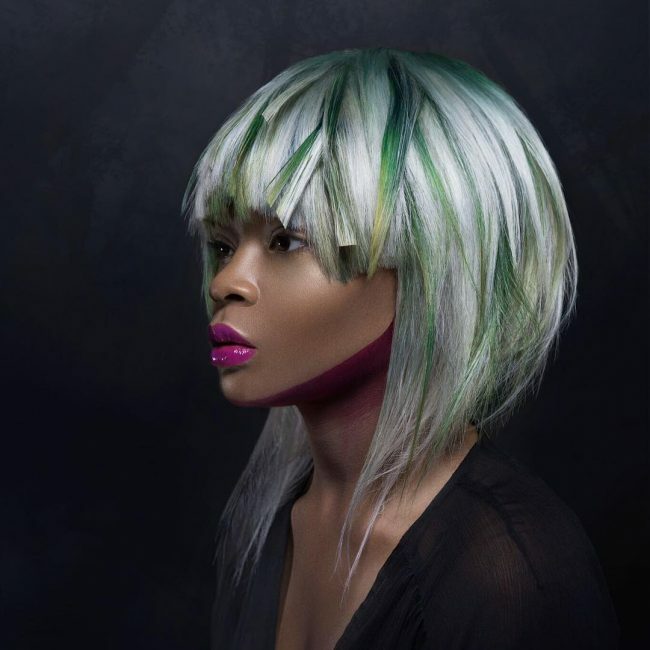 A tapered bob has been cut at ear length and long fringe has been added. 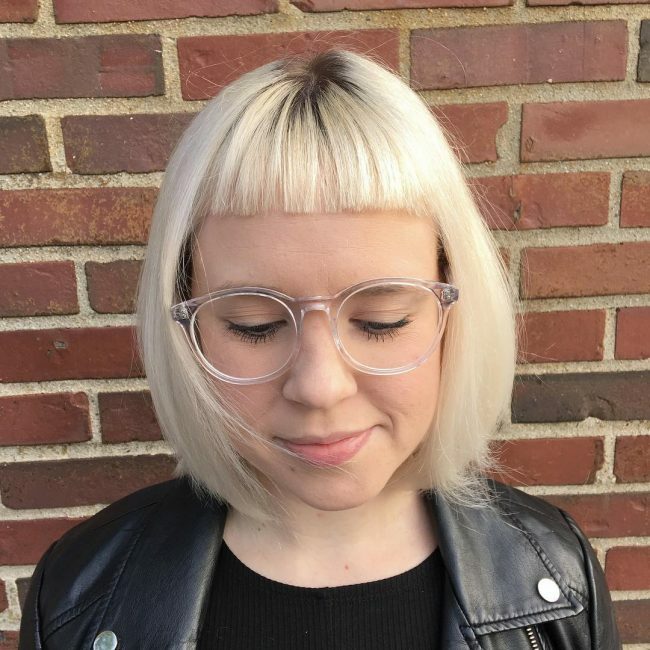 This fringe has two distinct lengths and has been straightened. The sides have been ironed into ringlets however; these sit quite flat on the head, creating a tight mass of curls. The color is a vivid butterfly orange with subtle peach highlights. 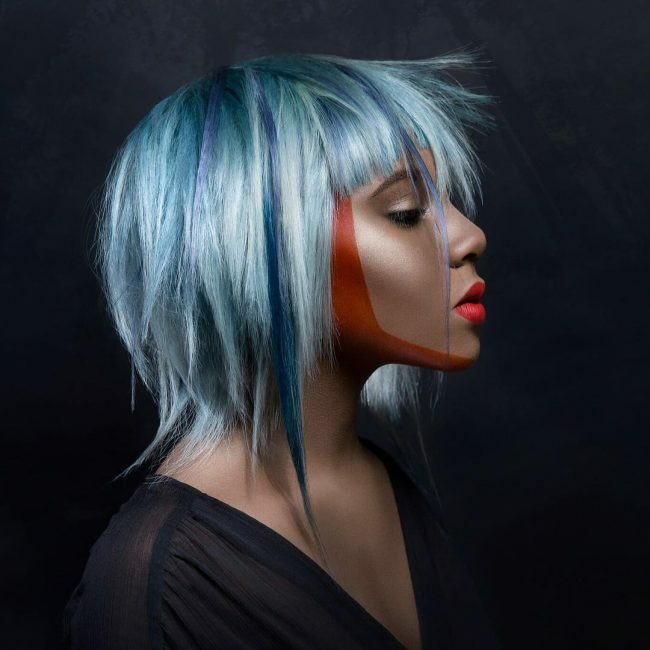 In this picture we see a leather black geometric bob cut that just covers the ears and has a rounded fringe. The hair has been ironed and smoothed down to create a flawless finish. To add interest a small section of locks on the side have been left longer and peak out from under the bob on the left side. This hair is tousled to create a contrast. Glossy amethyst streaks have also been added. 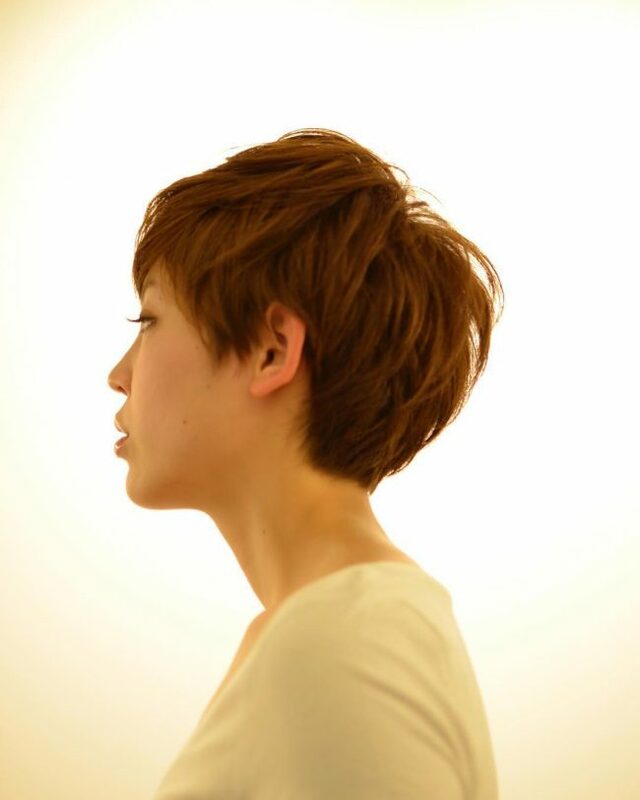 In this short cut, the back hair has been gently graded down to the nape of the neck and the ears have been left open. The style has sharp lines on the sides with a short rounded fringe. The look has been completed with a sunflower yellow color that is unusual and interesting. 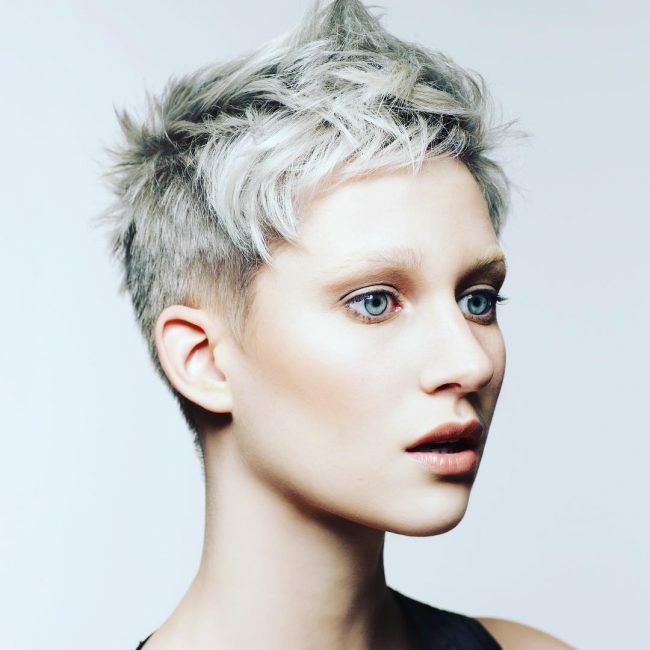 Loads of texture has been added to this cocoa colored pixie cut by ironing small sections of locks. The hair falls to the front, brushed down from the crown and at the back the style hugs the neck in neat graded bangs. The style is open around the ears and falls on the brow line. This style is so professional and frames the face wonderfully. It’s a straight bob cut that covers the ears and sits just on the chin. It’s been brushed down from the crown and a wide rounded fringe has been added to just brush the brows. All the hair has been ironed straight and mauve and pastel purple highlights have been added over a raven black base color. In this picture we see a long pixie that has sharp edges and bangs. 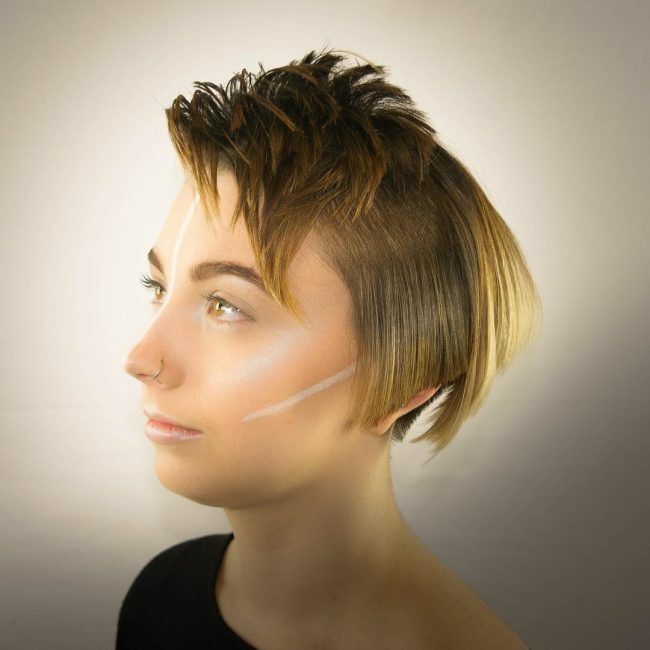 To create this look the hair has been brushed forward from the back and styled to fall over the side of the face, creating height on the left hand side and reaching onto the chin. The base color is a deep creamy brown with fun golden beige highlights. To begin this style an undercut has been shaved at the nape of the neck and along the sides. The rest of the hair transitions longer and longer towards the front and has been ironed into soft waves. 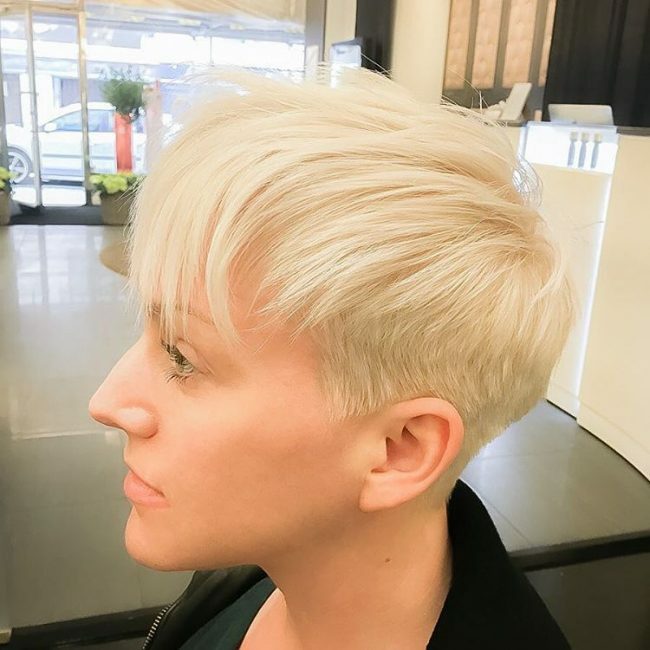 Full color has been applied in a pure diamond blonde and styled to fall softly on the cheekbone. 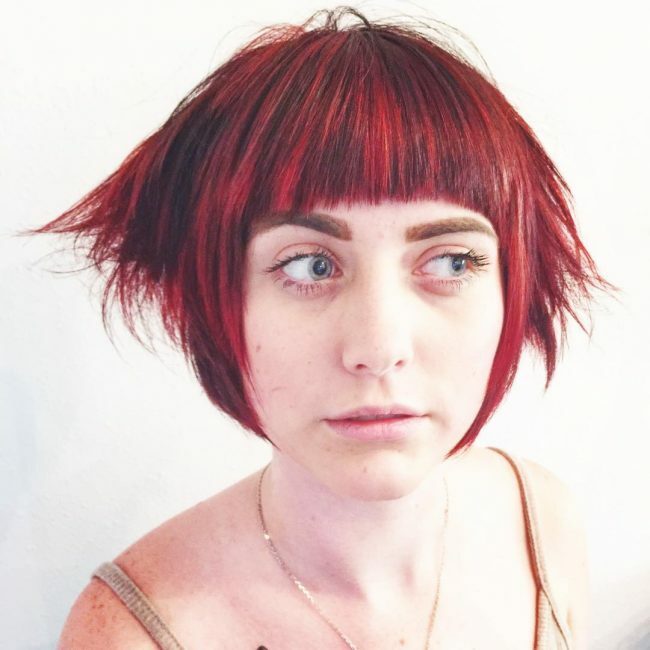 In this picture we see a long fringe that has been cut into layered bob that rests on the shoulders. The fringe is straightened and rests on the brow. The color palette used consists of earthy brown tones with lighter highlights. Team with sunnies for style a la Alexa Chung! 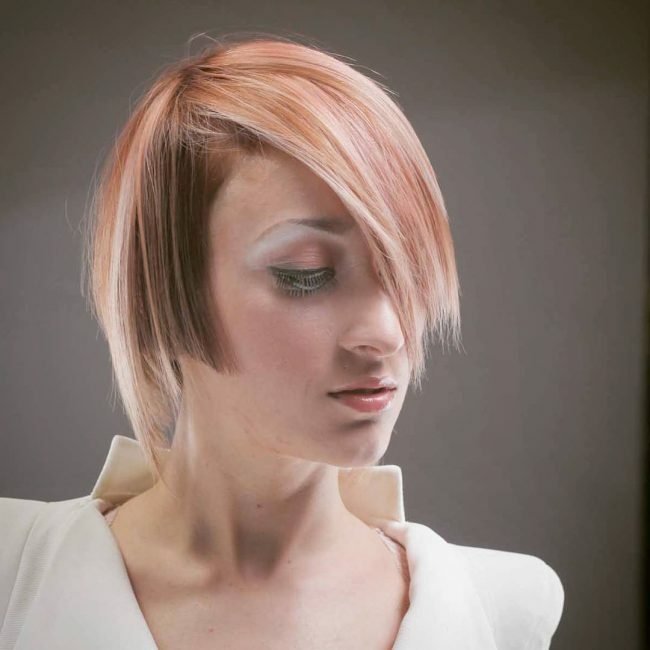 This fawn-hued hair has been cut to fall at collarbone length, the curled and teased to create a romantic soft texture. A straight fringe has been cut into the style and curled gently inwards. The fringe helps to balance the hairstyle and give it a radiant feel. In this style the hair has been at multiple lengths. On the front right side the hair is cut bluntly just below the ear and then layered at the back. The hair has been brushed forward from the back and styled to swoop over the left hand side of the face. There are varied colors within the hairstyle too; including medium brown and peach blonde. In this picture we see a choppy bob with many layers of bangs. The hair has been ironed and styled to fall forward slightly, with a cute flipped over fringe detail. The dark sombre colors look radiant next to her smooth skin and brilliant brown eyes. For this look the hair starts out short at the back and has been carefully blended longer and longer to create a voluminous top section. The hair has been layered and carefully ironed into small waves which have been styled to fall forward and to the side in a uniform fashion. 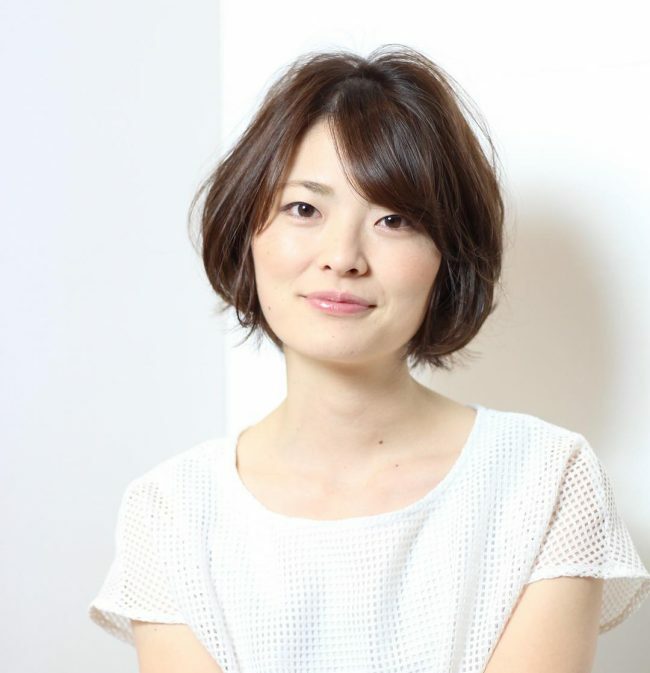 Here, a chunky layered bob has been cut to fall at chin level and given a destructured off center parting. The hair has been straightened and then ironed into waves. Then it has been flipped over to one side which helps to showcase the classic dark to light ombre color. The ash grey color with pearly microlights that we see here will definitely turn heads – just stunning! These glowing locks have been cut into a chunky chin length bob and a small fringe has been added. All the hair has been ironed and smoothed out. 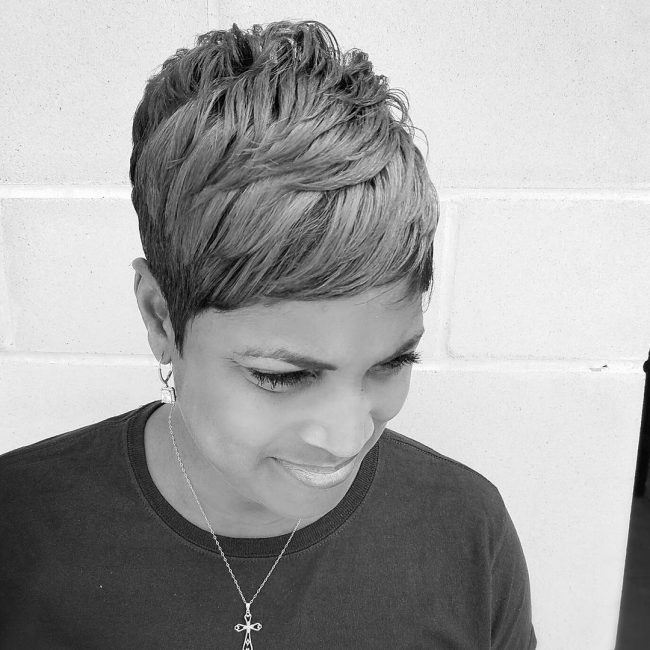 To create this look her tresses have been snipped into a sharp bob with clean edges. The cut sits on the ear and all the hair has been ironed out straight. 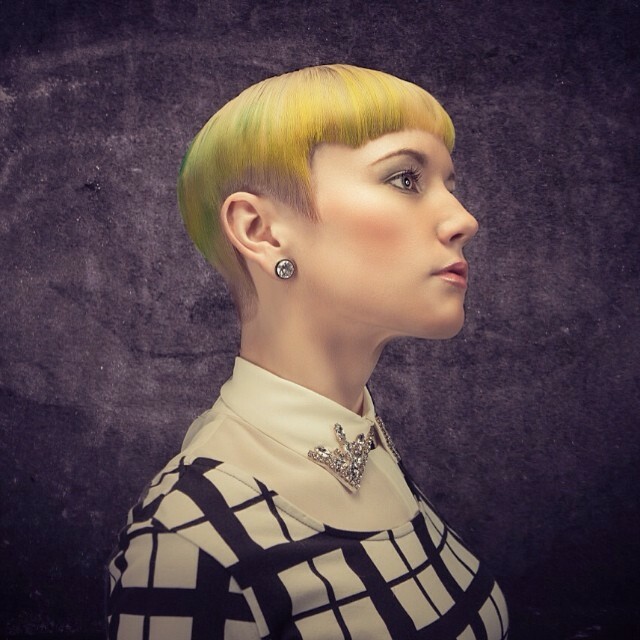 A super short fringe helps soften this style and creates interest with distinct scissor cuts. Some small blue highlights have also been added. This look starts with a razor cut along the sides and back that has been blended into longer locks on top. 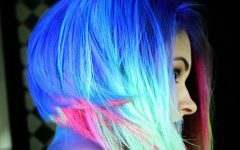 The bulk of the volume is set on top of the head; with straightened hair that has been styled up into a peak with teased hair around it. Under the seashell gray color we can see some dark roots. 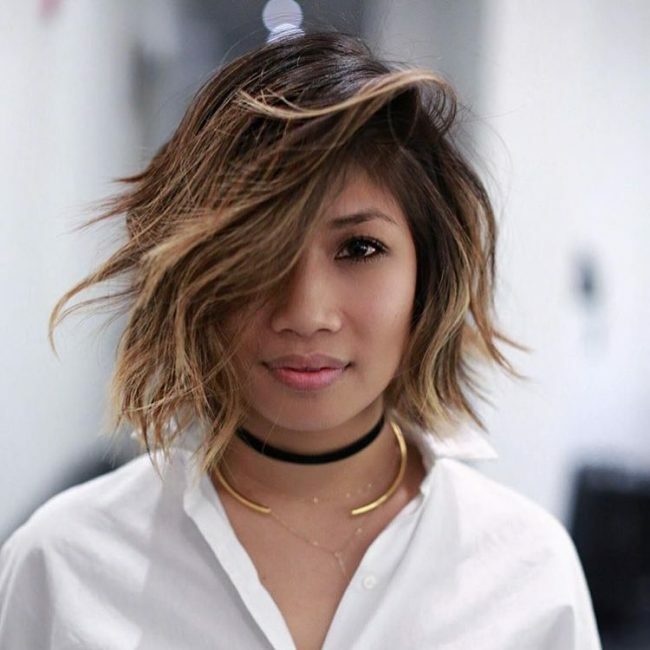 To create this ladylike look a long bob has been cut to shoulder length and dyed an ice blonde. This hair has been straightened and has smooth sleek edges. There is brushed over fringe and a high undercut is hidden under the layers. Creamy chocolate bangs that taper off to a short back help to create lots of volume and texture in this hairstyle. The hair has a messy centered parting and has been blown out so that it can be worn loose or tucked behind the ears. For catwalk ready hair why not try this style? 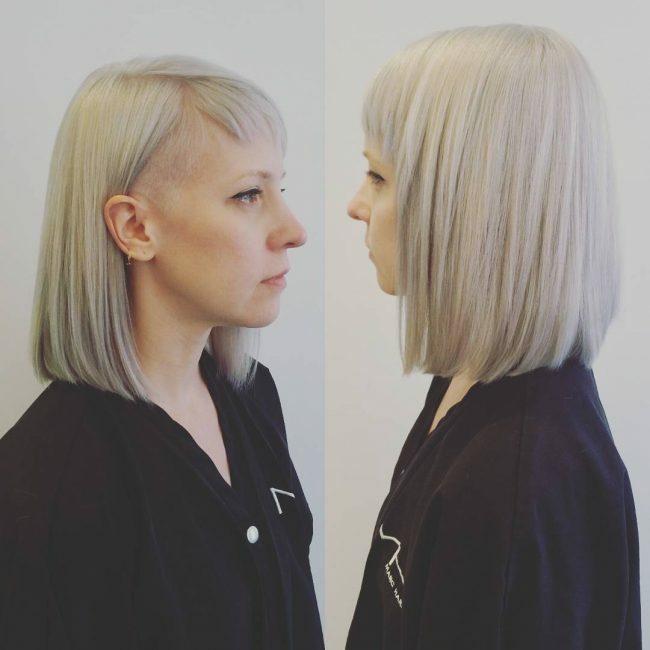 It’s a blunt chin length bob that has been cut to have feathery bangs, particularly in the front. A long full fringe has been added and straightened to fall onto the brows. The colors make this look pop – lovely gold and honey blondes. Now after seeing all these amazing styles, I have just one question: are you ready for a short cut? I’ve seen that there are so many styles to choose so you can be classy, romantic or edgy, or anything you like! Short styles will give you fewer hassles on crazy mornings and is easy to up style for the evenings. 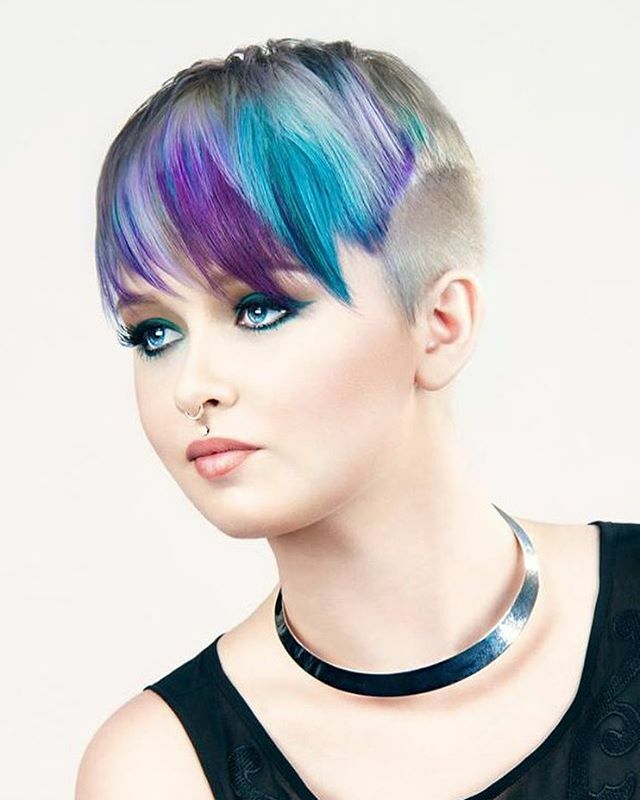 Edgier looks can be created by asymmetrical cuts, bright color or rough scissor cuts so short hair never has to mean boring! Make sure your short hair never looks flat by asking your stylist to cut some bangs for you. They create volume and feathery bangs are lovely for framing the face. 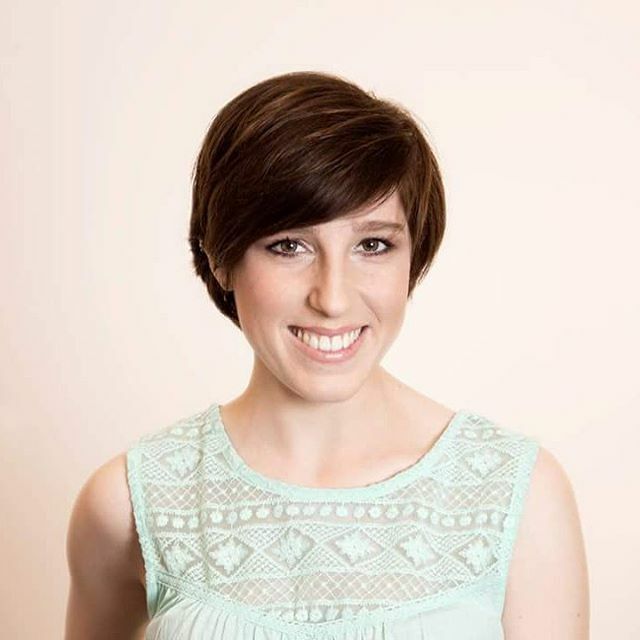 Everyone can look fantastic in short styles and bangs so why not give it a whirl next time you feel like a change? You won’t be disappointed!